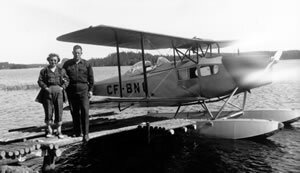 Norman W. Byrne was born in Sault Ste. Marie on February 17, 1912. He first came to the Northwest Territories in 1932 with his father, a prospector, and his brother Jerry. He attended McGill University, graduating in 1936 with a degree in Mining Engineering. As a mine engineer, Byrne worked at Gold Fields (Uranium City), Saskatchewan and Outpost Island (middle of Great Slave Lake) before becoming involved in the construction of the CANOL Pipeline during the Second World War. In 1944 Byrne moved to Yellowknife (map) starting a business as a consultant and in that capacity was asked to survey the Discovery claims northeast of Yellowknife. He was so impressed with the claim that along with his father and brother purchased it. A mine was developed at Discovery and on February 10, 1950 poured it’s the first gold brick. Over 17 years of operation more than $35 million worth of gold was extracted from the claim. Despite Byrne's involvement with the Discovery claims, he continued to work as a consultant and was involved in developing Rayrock Mine, Northland Mine and Tundra Mine. In 1964 Byrne began a second career as a real estate developer in Yellowknife and his company constructed many houses and apartment buildings in the town. He was a strong supporter of the lobby group working to have Yellowknife established as the capital of the Northwest Territories and was actively involved in many community organizations in Yellowknife. As a vocal supporter of the establishment of a separate Catholic school system in the community he served as the chairman of the Separate School Board from its inception in 1951 until his death on November 14, 1973.